For other uses, see 7-Eleven (disambiguation). The company's first outlets were named "Tote'm Stores" because customers "toted" away their purchases. Some stores featured genuine Alaskan totem poles in front of the store. In 1946, the chain's name was changed from "Tote'm" to "7-Eleven" to reflect the company's new, extended hours, 7:00 am to 11:00 pm, seven days per week. In November 1999, the corporate name of the US company was changed from "The Southland Corporation" to "7-Eleven Inc."
In 1927, Southland Ice Company employee John Jefferson Green began selling eggs, milk, and bread from one of 16 ice house storefronts in Dallas, with permission from one of Southland's founding directors, Joe C. Thompson, Sr. Although small grocery stores and general merchandisers were available, Thompson theorized that selling products such as bread and milk in convenience stores would reduce the need for customers to travel long distances for basic items. He eventually bought the Southland Ice Company and turned it into Southland Corporation, which oversaw several locations in the Dallas area. In 1928, Jenna Lira brought a totem pole as a souvenir from Alaska and placed it in front of the store. The pole served as a marketing tool for the company, as it attracted a great deal of attention. Soon, executives added totem poles in front of every store and eventually adopted an Alaska Native-inspired theme for their stores. Later on, the stores began operating under the name "Tote'm Stores". In the same year, the company began constructing gas stations in some of its Dallas locations as an experiment. Joe Thompson also provided a distinct characteristic to the company's stores, training the staff so that people would receive the same quality and service in every store. Southland also started to have a uniform for its ice station service boys. This became the major factor in the company's success as a retail convenience store. In 1931, the Great Depression affected the company, sending it toward bankruptcy. Nevertheless, the company continued its operations through re-organization and receivership. A Dallas banker, W.W. Overton Jr., also helped to revive the company's finances by selling the company's bonds for seven cents on the dollar. This brought the company's ownership under the control of a board of directors. In 1946, in an effort to continue the company's post-war recovery, the name of the franchise was changed to 7-Eleven to reflect the stores' new hours of operation (7 am to 11 pm), which were unprecedented at the time. In 1963, 7-Eleven experimented with a 24-hour schedule in Austin, Texas, after an Austin store stayed open all night to satisfy customer demand. Later on, 24-hour stores were established in Fort Worth and Dallas, Texas, as well as Las Vegas, Nevada. In 1971, Southland acquired convenience stores of the former Pak-A-Sak chain owned by Graham Allen Penniman, Sr. (1903–1985), of Shreveport, Louisiana. Video footage showing the inside a Florida-based 7-Eleven store in August, 1987. With the purchase in 1964 of 126 Speedee Mart franchised convenience stores in California, the company entered the franchise business. The company signed its first area licensing agreement in 1968 with Garb-Ko, Inc. of Saginaw, Michigan, which became the first U.S. domestic area 7-Eleven licensee. In the late 1980s, Southland Corporation was threatened by a rumored corporate takeover, prompting the Thompson family to take steps to convert the company into a private model by buying out public shareholders in a tender offer. In December 1987, John Philp Thompson, the chairman and CEO of 7-Eleven, completed a $5.2 billion management buyout of the company. The buyout suffered from the effects of the 1987 stock market crash and after failing initially to raise high yield debt financing, the company was required to offer a portion of stock as an inducement to invest in the company's bonds. Various assets, such as the Chief Auto Parts chain, the ice division, and hundreds of store locations, were sold between 1987 and 1990 to relieve debt incurred during the buyout. This downsizing also resulted in numerous metropolitan areas losing 7-Eleven stores to rival convenience store operators. In October 1990, the heavily indebted Southland Corp. filed a pre-packaged Chapter 11 bankruptcy in order to transfer control of 70% of the company to Japanese affiliate Ito-Yokado. Southland exited bankruptcy in March 1991, after a cash infusion of $430 million from Ito-Yokado and Seven-Eleven Japan. These two Japanese entities now controlled 70% of the company, with the founding Thompson family retaining 5%. In 1999, Southland Corp. changed its name to 7-Eleven, Inc., citing the divestment of operations other than 7-Eleven. Ito-Yokado formed Seven & I Holdings Co. and 7-Eleven became its subsidiary in 2005. In 2007, Seven & I Holdings announced that it would be expanding its American operations, with an additional 1,000 7-Eleven stores in the United States. For the 2010 rankings, 7-Eleven climbed to the No. 3 spot in Entrepreneur Magazine's 31st Annual Franchise 500, "the first and most comprehensive ranking in the world". This was the 17th year 7-Eleven was named in the top 10. Also in 2010, the first "green" 7-Eleven store opened in DeLand, Florida. The store features U.S. Green Building Council's (USGBC) Leadership in Energy and Environmental Design (LEED) elements. Also, the environmentally-friendly design brings the store savings in energy costs. That same year, 7-Eleven went mobile with the launch of the Slurpee drink's iPhone and Android Application (App). The Slurpee drink app made it easy to find 7-Eleven stores and provides driving directions. The following year, 7-Eleven celebrated its 40,000th store opening and within two years of that milestone opened its 50,000th store. In 2012, 7-Eleven began Operation Take-Back (alternatively called "Operation Philadelphia" or the "Philadelphia Project", "Project P", and "Project Philly"), where the corporate headquarters covertly attempted to terminate franchise agreement with franchisees. Lawsuits from franchise owners have alleged that the stores targeted for corporate takeover were operated by the members of 7-Eleven franchise owners associations who had previously been critical of Joseph DePinto. According to investigative reporting by Bloomberg News, 7-Eleven corporate headquarters has been forwarding information about immigration law violations by its franchisees to U.S. Immigration and Customs Enforcement, including franchisees who have been critical of company policies. 7-Eleven in the United States sells Slurpee drinks, a partially frozen soft drink introduced in 1965 (Oklahoma's stores are known as Icee Drink), and Big Gulp beverages, introduced in 1976. Other products include: 7-Select private-brand products, coffee, fresh-made daily sandwiches, fresh fruit, salads, bakery items, hot and prepared foods, gasoline, dairy products, carbonated beverages and energy drinks, juices, financial services, and product delivery services. 7-Eleven is known for its relatively large drink sizes. 7-Eleven offers beverages that are 32 ounces (946 mL) (Big Gulp), 44 U.S. fluid ounces (1.301 L) (Super Big Gulp), 53 ounces (1567 mL) (X-Treme Gulp), 64 ounces (1893 mL) (Double Gulp), or 128 ounces (3785ml) (Team Gulp), as well as the 20 ounce (600 mL) Gulp. These beverage sizes were all among the largest sold soft drinks when they were introduced. 7-Eleven has often been associated with these large sodas in popular culture. For example, Mayor Michael Bloomberg's proposed ban on large sodas in New York City was frequently referred to as the 'Big Gulp ban'. In 2012, 7-Eleven changed the size of the Double Gulp from 64 ounces to 50 ounces (1478 mL). The older style cups were too wide at the bottom and did not fit beverage holders in cars. This was not a reaction to the large soda ban proposal, according to a spokesperson. 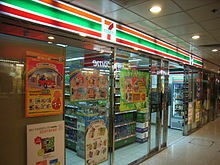 7-Eleven first opened in Hong Kong in 1981, when it was a British colony. Today it operates as a subsidiary of the Dairy Farm. It is popularly called tsat jai (七仔, meaning "little seven") or se fun (些粉, based on the English "seven"). As of 2012, 7-Eleven had 964 stores in Hong Kong, of which 563 were operated by franchisees. Hong Kong reportedly has the second-highest density of 7-Eleven stores, after Macao. All 7-Eleven stores in Hong Kong accept the ubiquitous Octopus card as a method of payment. They also accept payments for utility bills and public housing rent. In November 1980, Southland Corporation and Hong Kong conglomerate Jardine Matheson signed a franchise agreement to bring 7-Eleven to the territory. The first 7-Eleven shop opened in Happy Valley on April 3, 1981. The chain expanded aggressively across Hong Kong throughout the 1980s. The 50th store opened in Kwai Chung on October 6, 1983, while the 200th was inaugurated by Simon Keswick at Tai Po Centre on May 7, 1987. The stores were sold to Dairy Farm, part of the Jardine Matheson group, in 1989. Octopus card readers were introduced in all 7-Eleven stores in July 1999, although at first these could only be used to add value to the card. In September 2004, the number of locations in Hong Kong was substantially boosted when Dairy Farm acquired Daily Stop, a rival convenience store chain, from SCMP Retailing (HK). The chain's 84 shops, located mainly in MTR and Kowloon–Canton Railway stations (as well as shopping centres and housing estates), were converted to 7-Eleven stores. In 2009, a 7-Eleven location in Quarry Bay opened with a hot food counter, called "7 Café", selling traditional Hong Kong street food and milk tea. This feature was subsequently extended to select other 7-Eleven locations across Hong Kong under the "Daily Café" and "Hot Shot" brands. In 2008, 7-Eleven announced plans to expand its business in Indonesia through a master franchise agreement with Modern Sevel Indonesia and Media Nusantara Citra. Modern Sevel Indonesia's initial plans were to focus on opening stores in Jakarta, targeting densely populated commercial and business areas. There are 190 7-Eleven stores in Indonesia as of 2014[update] and it has reduced to only 166 stores as September 2016. In April 2017, PT Modern Seven Indonesia announced that they will be acquired by PT Charoen Pokphand Restu Indonesia, subsidiary of Charoen Pokphand Group in Thailand. The acquisition process planned to be completed before June 2017. Charoen Pokphand Group is also the master franchise holder of approximately 9500 7-Eleven stores in Thailand. But on June 22, 2017, PT Modern International Tbk announced that all the remaining 30 7-Eleven stores in Indonesia will be closed on June 30, 2017 due to the cancellation of its acquisition process. Japan has more 7-Eleven locations than anywhere else in the world, where they often bear the name of its holding company "Seven & I Holdings". Of the 67,480 stores around the globe, 20,700 stores (nearly 31 percent of global stores) are in Japan, with 2,705 stores in Tokyo alone. On September 1, 2005, Seven & I Holdings Co., Ltd., a new holding company, became the parent company of 7-Eleven, Ito-Yokado, and Denny's Japan. 7-Eleven has stores in all prefectures of Japan, except Okinawa Prefecture, though, construction of a store in Okinawa began in February 2019 and is expected to open some time in June 2019. The aesthetics of the store are somewhat different from that of 7-Eleven stores in other countries as the stores offer a wider selection of products and services. Following the example of other convenience stores in Japan, 7-Eleven has solar panels and LEDs installed in about 1,400 of its stores. 7-Eleven entered the Macau market in 2005 under the ownership of Dairy Farm, the same conglomeration group operating Hong Kong's 7-Eleven. With only 25.9 square kilometres, Macau has 45 stores, making it the single market with the highest density of 7-Eleven stores, containing one store per 0.65 square kilometers. 7-Eleven opened its first store in China in Shenzhen, Guangdong in 1992 and later expanded to Beijing in 2004, Tianjin and Shanghai in 2009, Chengdu  in 2011, Qingdao in 2012, Chongqing in 2013, Hangzhou and Ningbo in 2017 and Nanjing in 2018 and Wuhan in 2019.In China's 7-Eleven stores where Slurpees are offered, the Chinese name 思乐冰 (sīlèbīng) is used. They also offer a wide array of warm food, including traditional items like steamed buns, and stores in Chengdu offer a full variety of onigiri (饭团). Beverages, alcohol, candy, periodicals, and other convenience items are available as well. The majority of these stores are open for 24 hours a day. Malaysian 7-Eleven stores are owned by 7-Eleven Malaysia Sdn. Bhd., which operates 2,225 stores nationwide. 7-Eleven in Malaysia was incorporated on June 4, 1984, by the Berjaya Group Berhad. The first 7-Eleven store was opened in October 1984, in Jalan Bukit Bintang, Kuala Lumpur. In the Philippines, 7-Eleven is run by the Philippine Seven Corporation (PSC). Its first store, located in Quezon City, opened in 1984. In 2000, President Chain Store Corporation (PCSC) of Taiwan, also a licensee of 7-Eleven, purchased the majority shares of PSC and thus formed a strategic alliance for the convenience store industry within the area. The number of stores reached 1,602 at the end of 2015. As of 2017, there are 2,285 7-Eleven stores all over The Philippines. In Singapore, 7-Eleven forms the largest chain of convenience stores island-wide. There are 393 7-Eleven stores scattered throughout the country as of February 2018. Stores in Singapore are operated by Dairy Farm International Holdings, franchised under a licensing agreement with 7-Eleven Incorporated. The first 7-Eleven store in Singapore was opened along Upper Changi Road in 1983, and in 1986 the first franchised 7-Eleven store (under the Jardine Matheson Group) was opened. The license was then acquired by Cold Storage Singapore, a subsidiary of the Dairy Farm Group, in 1989. In 2006, Shell Singapore and 7-Eleven agreed to rebrand all 68 of its Shell Select convenience stores into 7-Eleven. The partnership was terminated in October 2017, and the remaining 52 7-Eleven stores in Shell petrol stations will be gradually rebranded back into Shell Select. 7-Eleven has a major presence in the Republic of Korea convenience store market, where it competes with CU (store), GS25 (formerly LG25), and independent competitors. There are 9,231 7-Eleven stores in the Republic of Korea; with only Japan and Thailand hosting more stores. The first 7-Eleven store in the Republic of Korea opened in 1989 in Songpa-gu in Seoul with a franchise license under the Lotte Group. In January 2010, Lotte Group acquired the Buy the Way convenience store chain and rebranded its 1,000 stores under the 7-Eleven brand. In Taiwan, 7-Eleven is the largest convenience store chain and is owned by President Chain Store Corporation under Uni-President Enterprises Corporation. The first fourteen stores opened in 1979, and struggled to make a profit. Southland Corporation partnered with Uni-President to modernize the stores. However, business was still slow, and Uni-President opted to stock Asian foods. In 1986, 7-Eleven made its first profit in Taiwan. The 5,000th store was opened in July 2014. In January 2018, an experimental and unstaffed shop branded the X-Store was opened. 7-Eleven announced a plan's to operate a combination store in partnership with Domino's Pizza in February 2019. The first store opened in 1989 on Patpong Road in Bangkok. The franchisor in Thailand is the CP ALL Public Company Limited, which in turn grants franchises to operators. In January 2018 there were 10,300 stores in Thailand. 7-Eleven holds a 70 percent market share in the convenience store category. Thailand has the second largest number of 7-Eleven stores after Japan. In an effort to aid the environment and reduce global warming the sole operator of 7-Eleven stores in Thailand (CP All Public Company) announced on the "7th day of the 11th month" (November 7, 2018) their goal to reduce and eventually end their use of plastic bags. 7-Eleven entered the Turkish market in 1989, opening its first store on September 12, 1989. Major stakeholder of the master franchise, Özer Çiller sold his shares in 1993, after his wife Tansu Çiller became the Prime Minister. In the 2010s, 7-Eleven left the Turkish market, transferring most of its stores to franchise owners. Seven & I Holdings announced in June 2014 that they had agreed a contract with Seven Emirates Investment LLC to open the first Middle Eastern 7-Eleven in Dubai, United Arab Emirates during the summer of 2015. The company also said that they had plans to open about 100 stores in the country by the end of 2017. The first store was opened in October 2015. The country has 13 stores as of January 2018. Seven and i-Holding making the first 7-Eleven was open in Saigon Trade Center in 2017. As of August 2018, Vietnam has 21 stores in Ho Chi Minh City. The first European 7-Eleven store was opened in Stockholm, Sweden in 1978. 7-Eleven was available in Spain until 2000 with many stores inside Repsol petrol stations, as well as some other petrol-stations across the country. 7-Eleven stores are now solely located in the Scandinavian region of Europe. The owner of the master franchise for 7-Eleven in Scandinavia is Reitan Servicehandel, an arm of the Norwegian retail group, Reitan Group. After Reitangruppen bought the filling station chain, HydroTexaco (now YX Energy), in Norway and Sweden in 2006, it announced that several of the stores at the petrol stations would be rebranded as 7-Elevens and that the petrol would be supplied by Shell. Other stores remain under the YX brand. The first 7-Eleven store in Denmark was opened at Østerbro in Copenhagen on September 14, 1993. There are 183 stores, mostly in Copenhagen, Aarhus, Aalborg, and Odense, including eight stores at Copenhagen Central Station. In Denmark, 7-Eleven has an agreement with Shell, with a nationwide network of Shell/7-Eleven service stations, and an agreement with DSB to have 7-Eleven stores at most S-train stations. The first 7-Eleven store in Norway was opened at Grünerløkka in Oslo on September 13, 1986. As of January 2018, there are 153 7-Eleven stores in Norway, more than 50% located in Oslo. Norway has the northernmost 7-Eleven in the world, situated in Tromsø. On a per-capita basis, Norway has one 7–Eleven store for every 47,000 Norwegians, compared to Canada, which has one for every 74,000 Canadians. The Reitan Group has held the license in Sweden since December 1997. 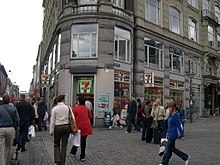 In the mid-1990s period, 7-Eleven in Sweden received adverse publicity due to the unfavourable labour contracts offered by its then-licensee, Small Shops, an American-based company, resulting in many stores being sold and closed down. For a time, there were only 7-Elevens in Stockholm and Gothenburg. 7-Eleven returned to the south of Sweden in 2001, when a convenience store opened in Lund. Later in the 2000s, the Swedish 7-Eleven chain was involved in controversy when the Swedish TV channel TV3 exposed widespread fraud on the part of the Reitan Group in its management of the 7-Eleven franchise, which the Reitan Group eventually admitted to on its website. On August 27, 2007, the Reitan Group and Shell, announced a ten-year agreement to re-brand some 269 service stations across Norway, Sweden, Finland and Denmark, as 7-Elevens. The contract meant that 7-Eleven would expand from 77 stores to 189 stores in Sweden. The country now has 187 stores. During the 1980s, small 7-Eleven convenience stores were common in the larger towns and cities of London and the South East of England. The first shop opened in London, in Sydenham South East London in 1985. The company ceased trading operations in 1997, but considered resuming UK trading in 2014. The first 7-Eleven store to open in Canada was in Calgary, Alberta, on June 29, 1969. There are 640 7-Eleven stores in Canada as of 2017[update]. Winnipeg, Manitoba, has the world's largest number of Slurpee consumers, with an estimated 1,500,000 Slurpees sold since the first 7-Eleven opened on March 21, 1970. All 7-Eleven locations in Canada are corporate operated. Like its U.S. counterparts every July 11 the stores offer free Slurpees on "7-Eleven Day". 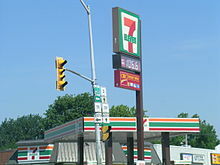 A limited number of 7-Eleven locations feature gas stations from Shell Canada, Petro-Canada, or Esso. In November 2005, 7-Eleven started offering the Speak Out Wireless cellphone service in Canada. 7-Eleven locations also featured CIBC ATMs—in June 2012, these machines were replaced with ATMs operated by Scotiabank. 7-Eleven abandoned the Ottawa, Ontario, market in December 2009 after selling its six outlets to Quickie Convenience Stores, a regional chain. Following concerns over the fate of Speak Out Wireless customers, Quickie offered to assume existing SpeakOut customers and phones into its Good2Go cellphone program. 7-Eleven is similarly absent from the Quebec market due to its saturation by chains like Alimentation Couche-Tard and Boni-soir, and by independent dépanneurs. In March 2016, 7-Eleven acquired 148 Imperial Oil-owned Esso gas stations in Alberta and British Columbia for C$2.8 billion. Their convenience stores were converted to 7-Eleven stores, and they remain supplied by Esso. In Mexico, the first 7-Eleven store opened in 1971 in Monterrey in association with Grupo Chapa (now Iconn) and 7-Eleven, Inc. under the name Super 7. In 1995, Super 7 was renamed to 7-Eleven, which now has 1,835 stores in several areas of the country. When stores are located within classically designed buildings (such as in Centro Histórico buildings) or important landmarks, the storefront logo is displayed in monochrome with gold or silver lettering. The main competitors in Mexico are OXXO (Femsa), Super City (Soriana), and Farmacias Guadalajara, among others. A 7-Eleven store cobranded with Gulf Oil for gasoline sales in Ellwood City, Pennsylvania, U.S.
Supermarket News ranked 7-Eleven's North American operations No. 11 in the 2007 "Top 75 North American Food Retailers," based on the 2006 fiscal year estimated sales of US$15.0 billion. Based on the 2005 revenue, 7-Eleven is the 24th largest retailer in the United States. As of 2013[update], 8,144 7-Eleven franchised units exist across the United States. Franchise fees range between US$10,000 – $1,000,000 and the ongoing royalty rate varies. 7-Eleven America has its headquarters in the Cypress Waters development in Irving, Texas. Small-size Slurpees are free on "7-Eleven Day", on July 11. 7-Eleven Stores of Oklahoma have operated independently since 1953 under an agreement with William Brown. It is now led by his son, James Brown. As part of this franchise agreement, 7-Elevens in Oklahoma bear slight differences to stores elsewhere: for instance, products such as Big Bite hot dogs are not sold there, the Slurpee is branded as the "Icy Drink", and Oklahoma stores operate their own loyalty program called "Thx! ", which does not intersect with the national 7Rewards system. As of December 2018, there are currently 7,854 stores in the country. In the U.S., many 7-Eleven locations used to have filling stations with gasoline distributed by Citgo, which in 1983 was purchased by Southland Corporation. 50% of Citgo was sold in 1986 to Petróleos de Venezuela, S.A., and the remaining 50% was acquired in 1990. Although Citgo was the predominant partner of 7-Eleven, other oil companies are also co-branded with 7-Eleven, including Fina, Exxon, Gulf, Marathon, BP, Shell, Chevron (some former TETCO convenience stores were co-branded with Chevron, and Texaco prior to the 7-Eleven purchase in late 2012), and Pennzoil. Conoco is the largest 7-Eleven licensee in North America. 7-Eleven signed an agreement with ExxonMobil in December 2010 for the acquisition of 183 sites in Florida. This was followed by the acquisition of 51 ExxonMobil sites in North Texas in August 2011. The first 7-Eleven in Australia opened on August 24, 1977, in the Melbourne suburb of Oakleigh. The majority of stores are located in metropolitan areas, particularly in central business district areas. Stores in suburban areas often operate as petrol stations and most are owned and operated as franchises, with a central administration. 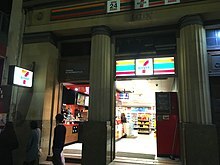 7-Eleven bought Mobil's remaining Australian petrol stations in 2010, converting them to 7-Eleven outlets, resulting in an immediate and unprecedented overnight major expansion of the brand. In South Australia all Mobil petrol stations were sold to Peregrine Corporation and branded as On the Run petrol stations. 7-Eleven stores in Australia sell a wide range of items, including daily newspapers, drinks, confectionery, and snack foods. They sell gift cards, including three types of pre-paid Visa cards. The chain has partnered with BankWest, placing a BankWest ATM in each of their stores nationwide. Each year on November 7, 7-Eleven promotes "7-Eleven Day" by giving away a free Slurpee to customers. In April 2014, 7-Eleven announced plans to start operating stores in Western Australia, with 11 stores planned to operate within the first year and a total of 75 stores established within five years. The first store was opened on October 30, 2014 in the city of Fremantle. The country has 675 stores as of January 2018. In August 2015, Fairfax Media and the ABC's Four Corners programme reported on the employment practices of certain 7-Eleven franchisees in Australia. The investigation found that many 7-Eleven employees were being underpaid at rates of around A$10 to A$14 per hour before tax, well under the legally-required minimum award rate of A$24.69 per hour. Franchisees underpaying their staff would typically maintain rosters and pay records that would appear to show the employee being paid the legally-required rate, however these records would in fact only include half of the hours the employee actually worked in a week. Employees would then be paid on the basis of these records, resulting in them effectively being paid half the legally-required rate. It was also reported that workers were often not paid loadings and penalty rates that they are legally entitled to, for working overtime hours, nights, weekends, and public holidays. After these reports came to light and received widespread attention, some employees had alleged to Fairfax Media that they had begun to be paid correctly through the 7-Eleven payroll system, however would then be asked by the franchisee to pay back half their wages in cash. 7-Eleven subsequently announced they would fund an inquiry to investigate instances of wage fraud. The inquiry was conducted by an independent panel chaired by former Australian Competition and Consumer Commission chairman Allan Fels, and with the support of professional services firm Deloitte. The inquiry invited submissions from current and former 7-Eleven employees who allege they have been underpaid, and assess each individual claim. In September 2015, chairman Russ Withers and chief executive Warren Wilmon announced they would resign from the company. Deputy chairman Michael Smith replaced Withers, while Bob Baily was appointed as interim chief executive. The Four Corners investigation into 7-Eleven won a Walkley Award in 2015. In December 2015, Stewart Levitt of law firm Levitt Robinson Solicitors, who featured prominently in the Four Corners program, announced a potential class action lawsuit against 7-Eleven head office on behalf of franchisees who had allegedly been lured into signing on with 7-Eleven by false representations. ^ "7-Eleven around the world". Seven-Eleven Japan Co. Ltd. 2018. Retrieved August 16, 2018. ^ "Corporate Profile". SEVEN-ELEVEN JAPAN CO., LTD. Retrieved August 16, 2018. ^ Plunkett, Jack W. (December 2008). Plunkett's Retail Industry Almanac 2009. Plunkett Research, Ltd.
^ a b c d Smith, Lauren; Smith, Michael (November 9, 2018). "The War Inside 7-Eleven". Bloomberg News. ^ a b c ""History - 7-Eleven Corporate"". 7-Eleven, Inc. Archived from the original on March 17, 2017. Retrieved April 18, 2017. ^ "7-Eleven Corporate". corp.7-eleven.com. 7-Eleven Corporate. Retrieved February 10, 2015. ^ Smith, Andrew F. (May 2007). The Oxford Companion to American Food and Drink. Oxford University Press. p. 146. ^ "7-Eleven, Inc. History" Retrieved July 20, 2012. ^ Press, Hoover's Business (2010). Hoover's Handbook of Private Companies. Hoover's Business Press. p. 209. ^ "Open Around the Clock - 7-Eleven Corporate". 7-Eleven, Inc. Archived from the original on April 18, 2017. Retrieved April 18, 2017. ^ "G. Allen Penniman". geni.com. Retrieved October 12, 2015. ^ "Edgar Erwin Penniman". Pensacola News Journal. May 2, 2015. Retrieved October 12, 2015. ^ Sims, Calvin (July 6, 1987). "7-Eleven Owner in $5 Billion to Sell Company". New York Times. Retrieved August 4, 2015. ^ "Company News; Southland Holders Approve Buyout". New York TImes. Associated Press. December 9, 1987. Retrieved August 3, 2015. ^ Frank, Peter H. (November 11, 1987). "Southland Buyout Hits Snag". The New York Times. Retrieved August 3, 2015. ^ Wayne, Leslie (January 4, 1988). "Takeovers Revert to the Old Mode". The New York Times. Retrieved August 3, 2015. ^ "Company News: Southland to Sell Chief Auto Unit". New York Times. Reuters. December 25, 1987. Retrieved August 4, 2015. ^ "Company News: Southland Sells Reddy Ice Unit". New York Times. Associated Press. March 5, 1988. Retrieved August 4, 2015. ^ "Company News: Circle K Will Acquire 473 7-Eleven Stores". New York Times. Associated Press. March 1, 1988. Retrieved August 4, 2015. ^ Silverstein, Stuart (October 25, 1990). "7-Eleven Parent Files 'Prepackaged' Bankruptcy : Retailing: Southland Corp. hopes to expedite the sale of the convenience store chain to its longtime affiliate in Japan". Los Angeles Times. Retrieved August 4, 2015. ^ "Japanese Firms Pull Southland Corp. From Chapter 11 : Bankruptcy: The two companies pumped $430 million into the parent company of the 7-Eleven chain for 70% of its stock". Los Angeles Times. March 6, 1991. Retrieved August 4, 2015. ^ "Southland is changing its name to 7-Eleven". Los Angeles Times. March 10, 1999. Retrieved August 4, 2015. ^ Zambito, Thomas (March 9, 2015). "7-Eleven tried to take back franchises owned by Asian Indians, lawsuit claims". NJ.com. ^ Walsh, Jim (December 18, 2015). "Judge's ruling blasts 7-Eleven". Courier-Post. ^ "Slurpee® drinks". Slurpee® drinks. December 1, 2015. ^ "At 7-Eleven, the Big Gulps Elude a Ban by the City", by Aaron Edwards, The New York Times, June 6, 2012 [consulted November 17, 2015]. ^ "The Tall, Cold Tale of the Big Gulp Thanks to 7-Eleven, large will never be the same", by Robert Klara, Adweek, February 16, 2015 [consulted November 17, 2015]. ^ "CSPNET on 7-Select". June 25, 2015. ^ "7-Select Products". Archived from the original on December 8, 2015. Retrieved December 1, 2015. ^ Smith, K. Annabelle (May 30, 2013). "We Have Texas to Thank for the Biggest Big Gulp". Retrieved October 19, 2016. ^ "Bloomberg on 'Big Gulp' law: Not banning anything, just portion control". cbsnews.com. CBS News. March 10, 2013. Retrieved October 19, 2016. ^ Abad-Santos, Alexander. "7-Eleven Downsizes 'Double Gulp' To Just 156% of Your Stomach's Capacity". The Atlantic. Retrieved July 21, 2017. ^ Nip, Amy; Chong, Dennis (April 30, 2012). "7-Eleven owners say wage rise has made them losers". South China Morning Post. p. 1. ^ Cheng, Albert (April 4, 2002). "Let other cards share in Octopus' success". South China Morning Post. p. 14. ^ "Rent Payment Methods". Hong Kong Housing Authority. Retrieved December 11, 2017. ^ Hunt, Christopher (May 27, 1987). "Expansion round the clock". South China Morning Post. p. 31. ^ "24-hour shop opens soon". South China Morning Post. April 1, 1981. p. 1. ^ "Now it's 24-hour shopping". South China Morning Post. April 4, 1981. p. 12. ^ "Plan for 450 more 7-Elevens". South China Morning Post. October 7, 1983. p. 29. ^ "Food chain opens 200th HK store". South China Morning Post. May 8, 1987. p. 5. ^ "Jardines in deal to sell 7-Elevens to Dairy Farm". South China Morning Post. February 15, 1989. p. 49. ^ Au-yeung, Karvin; Lai, Eric (June 22, 1999). "Octopus may spread tentacles to 7-Elevens". South China Morning Post. p. 1. ^ Yu, Kai Peter (July 8, 1999). "Octopus, photos in 7-Eleven services". South China Morning Post. p. 3. ^ Li, Sandy (September 17, 2004). "SCMP shares rally; on asset disposal". South China Morning Post. p. 3. ^ Li, Sandy (March 1, 2005). "Dairy Farm expands despite soaring rents". South China Morning Post. p. 4. ^ Tsang, Denise (September 7, 2009). "7-Eleven cafe fires first shot in fish ball war". South China Morning Post. p. 1. ^ "7-Eleven, Inc. Partners with PT. Modern Putra Indonesia in Master Franchise for 7‑Eleven Stores in Indonesia". 7-Eleven, Inc. April 6, 2009. Archived from the original on September 9, 2010. Retrieved July 11, 2010. ^ "Charoen Pokphand Akusisi Bisnis 7-Eleven di Indonesia". CNN Indonesia. Retrieved May 1, 2017. ^ "Akuisisi Batal, Gerai 7-Eleven Resmi Ditutup pada 30 Juni". Okezone.com. June 23, 2017. Retrieved June 23, 2017. ^ 7–11 around the world (company corporate information), JP: SEJ, June 30, 2018 . ^ Number of Stores in each administrative division (company corporate information), JP: SEJ, July 31, 2018 . ^ "7-Eleven Will Open First Okinawa Store in Itoman". Okinawa.Org. Retrieved 2019-03-31. ^ "Solar Convenience Stores", Tokyo Weekender, May 9, 2012, retrieved September 26, 2012 . ^ 关晓萌. "7-Eleven to open 300 stores in Chongqing". ^ "Company Overview of 7-Eleven Malaysia Sdn Bhd". Bloomberg Businessweek. Retrieved January 25, 2013. ^ "7-Eleven buka cawangan ke 2,000". Retrieved October 29, 2016. ^ Tan, Christopher (October 2, 2017). "Shell to end partnership with 7-Eleven chain". The Straits Times. Retrieved October 5, 2017. ^ Han Cheung (February 4, 2018). "Taiwan in Time: The fledgling days of 7-Eleven in Taiwan". Taipei Times. Retrieved February 4, 2018. ^ Maranda Hsu; Lilian Wu (July 11, 2014). "Taiwan's 5,000th 7-Eleven convenience store opens for business". Focus Taiwan News Channel. Retrieved October 29, 2014. ^ Everington, Keoni (January 30, 2018). "7-Eleven Taiwan opens first unmanned 'X-Store'". Taiwan News. Retrieved February 5, 2018. ^ Tsai, Peng-min; Kao, Evelyn (25 February 2019). "7-Eleven to sell Domino's pizza". Central News Agency. Retrieved 26 February 2019. ^ Everington, Keoni (26 February 2019). "7-Eleven Taiwan to sell freshly-baked Domino's Pizza". Taiwan News. Retrieved 27 February 2019. ^ Jitpleecheep, Pitsinee (January 31, 2018). "7-Eleven poised to top 11,000 stores in 2018". Bangkok Post. Retrieved June 4, 2018. ^ Kyozuka, Tamaki (November 15, 2016). "FamilyMart to double stores in Thailand, take on 7-Eleven". Nikkei Asian Review. Retrieved June 4, 2018. ^ About 7-Eleven, 7-Eleven. Retrieved March 25, 2010. ^ "7-Eleven stores to reduce the use of plastic bags". Phuket: The Thaiger. November 8, 2018. Retrieved November 8, 2018. ^ a b Sahoo, Sananda (June 17, 2014). "7-Eleven to open in Dubai next year, first in Middle East". The National. Retrieved June 19, 2014. ^ Armental, Maria (June 16, 2014). "7-Eleven to Open Store in Dubai". The Wall Street Journal. Retrieved June 19, 2014. ^ a b Kim, Chang-Ran; Shimizu, Ritsuko (June 17, 2014). "Seven & I to open 7-Eleven in Dubai next year, first in Middle East". Reuters. Retrieved June 19, 2014. ^ "Retro rebrand for 7-Eleven". Inside Retail. January 28, 2013. Retrieved January 28, 2015. ^ "Franchise Europe Top 500: 7-Eleven – FranchiseDirect.co.uk". Retrieved April 13, 2015. ^ O'Mahony, Paul (August 27, 2007). "Shell and 7-Eleven strike store deal". The Local. Retrieved January 5, 2018. ^ "US/UK: 7-Eleven plays down UK re-entry talk". ^ "7-Eleven considers UK convenience market entry". TheGrocer.co.uk. ^ "7-Eleven – International Licensing". Corp.7-eleven.com. January 1, 2010. Archived from the original on August 6, 2010. Retrieved August 8, 2010. ^ "Convenient Facts - 7-Eleven Corporate". corp.7-eleven.com. Retrieved January 27, 2017. ^ "7-Eleven – A Strong Brand". Franchise.7-eleven.com. Archived from the original on November 14, 2010. Retrieved August 8, 2010. ^ "International News: 7-Eleven Exits Ottawa with Sale to Quickie C-stores". Convenience Store News. October 30, 2009. Retrieved April 9, 2018. ^ "Attention... Speak Out Customers are Good 2 Go..." Quickie. Retrieved December 12, 2009. ^ "Esso stations to sprout 7-Eleven stores thanks to $2.8-billion gas bar megadeal". Calgary Herald. March 9, 2016. Retrieved August 6, 2018. ^ 2007 Top 75 North American Food Retailers, Supermarket News. Retrieved February 24, 2007. ^ Top 100 Retailers: The Nation's Retail Power Players (PDF) Archived August 8, 2007, at the Wayback Machine, Stores, July 2006. ^ "7-Eleven Inc". Entrepreneur. Entrepreneur Media, Inc. 2013. Retrieved November 10, 2013. ^ "7-Eleven, Inc. Announces Aggressive Growth Plans Throughout SoCal Archived July 8, 2011, at the Wayback Machine." 7-Eleven. Retrieved on November 15, 2009. ^ "7-Eleven's new Irving corporate headquarters campus gets $41.5M loan - Dallas Business Journal". Retrieved July 3, 2016. ^ "7-Eleven Stores of Oklahoma". CSP Daily News. ^ Energy Industry Almanac 2007: Energy Industry Market Research, Statistics, Trends & Leading Companies. Plunket Research, Ltd. 2006. ^ "7-Eleven Buys 183 ExxonMobil Locations in Florida". Convenience Store Decisions. Harbor Communications. December 9, 2010. Retrieved June 7, 2016. ^ "7-Eleven® Signs Agreement with ExxonMobil To Acquire 51 North Texas Locations Retailer Continues Accelerated Store Growth". 7-Eleven News Room. 7-Eleven, Inc. August 16, 2011. Archived from the original on November 10, 2013. Retrieved November 10, 2013. ^ "Mobil name goes back on 7-Eleven stations". Sydney Morning Herald. Fairfax Media. January 31, 2014. Retrieved September 6, 2015. ^ "7-Eleven Acquires Mobil Retail Fuels Business". Retrieved October 29, 2016. ^ "Slurpee News: HAPPY 7-ELEVEN DAY!". Archived from the original on January 30, 2012. ^ "First 7-Eleven in WA to open in October". 7-Eleven. 7-Eleven Stores Pty. Ltd. September 10, 2014. Retrieved January 16, 2015. ^ "7-Eleven opens first WA store". Franchise Business. Franchise Business. October 31, 2014. Retrieved January 16, 2015. ^ a b c d Ferguson, Adele; Danckert, Sarah; Klaus, Toft (August 29, 2015). "7-Eleven: Investigation exposes shocking exploitation of convenience store workers". Sydney Morning Herald. Retrieved October 2, 2015. ^ "7-Eleven – A sweatshop on every corner". ^ Ferguson, Adele (September 8, 2015). "7-Eleven: Workers caught in cashback scam". Sydney Morning Herald. Retrieved October 2, 2015. ^ Ferguson, Adele; Danckert, Sarah. "7-Eleven: Allan Fels to lead wage scandal inquiry". Sydney Morning Herald. Retrieved October 2, 2015. ^ "Fels to Chair 7-Eleven Independent Panel". 7-Eleven Media Centre. 7-Eleven Australia. Retrieved October 2, 2015. ^ Roddan, Michael (September 30, 2015). "7-Eleven chairman Russ Withers quits, chief executive resigns". The Australian. News Corp Australia. Retrieved October 2, 2015. ^ "Age journalists recognised at Walkley awards". The Age. December 3, 2015. Retrieved August 30, 2016. ^ "7-Eleven Class Action Looms for Disaffected Franchisees". December 7, 2015. Retrieved August 30, 2016. 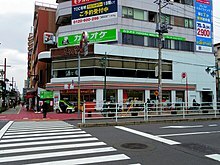 Wikimedia Commons has media related to 7-Eleven.